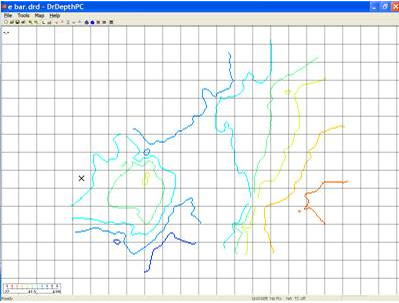 New tip added to www.hightechfishing.com on GPS accuracy when fishing a waypoint. This was a regular season tournament and a one day Championship. I did not find winning fish so I caught my limit each day and then looked for big fish which was a very week pattern based on memories which usually fail in tournaments and it did. I finished 18th in spite of slipping on the dock and nearly dumping my fish basket. I lost one fish and sadly watched it swim away. I have seen this happen to others and I have been very careful but after no failures for years, a little fatigue, and some tournament excitement I wasnt careful. The next day I had a death grip on the fish basket. The one day Championship was all or none so I fished ghost big fish spots as the winner got $50,000 and the other 49 got $750 so there was only one spot. The weights were low as many anglers threw back small fish like I did in hopes of finding winning fish. I fished with crankbaits and chubs. The crankbait contest winner (I pick my winner after each tournament) was the # 5 shad rap. The Salmo Sting was a weak second. I have not finalized these seminars and classes but it looks like a free electronics seminar at Warners Dock in New Richmond, WI Jan 10, 20008 and a Lowrance School plus a Mapping Class Jan 2, 2008 in Milwaukee. I am having the Lowrance School at this unusual time because I will be at a National Professional Anglers Association meeting Jan 3-4 in Milwaukee. Finalized seminar: Jan 17, 2008 South Dakota Walleyes unlimited meeting at Sioux Falls, SD. Details on these seminars and classes will be on www.hightechfishing.com when I have them finalized. DrDepth did it again and added another cool feature. You can make a contour map with DrDepth. Next save a map image and then you click on the KML file with the same name as the map file. If you are connected to the internet and have Google Earth on your computer you will see this map on Google Earth. It is cool when Google Earth starts up; the Earth spins and zooms into the DrDepth map automatically. 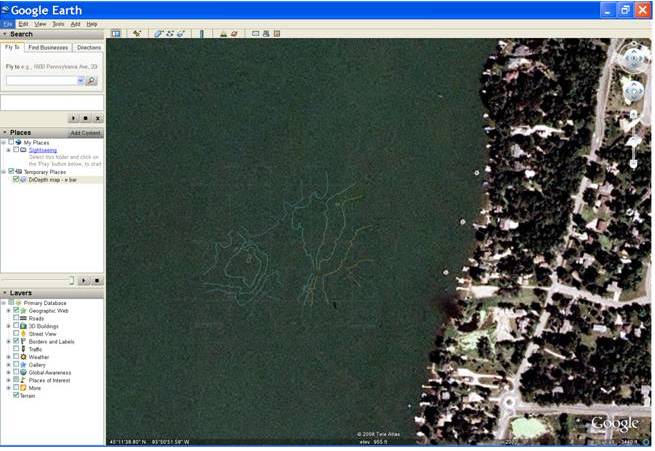 My last newsletter I demonstrated LakeMaster with a similar Google Earth feature. I keep wondering Whats Next?). It wasnt that long ago I was staring at a flasher for sonar and lining up birdhouses with windows for GPS. Details on DrDepth are at http://www.hightechfishing.com/drdepth.html. I am working on the data for my next DVD on sonar interpretation. If you have fished over a school of fish that dont bite and wonder why, I found a nice example this week. I was fishing a school of suckers and suckers dont like minnows! My Aqua-vu didnt help me catch these fish but it helped me understand my fishing experience. The depths from the Lowrance and the Aqua-vu dont match but are usually close.